Suitable for encasing columns and beams. Aid to fire protection. 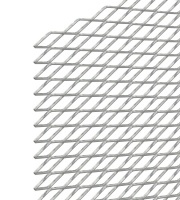 Suitable for suspended ceilings and partitions giving superior joint and crack reinforcement. 2500 x 700mm sheets. Galvanised mild steel to BS EN10142 DX51D Z275 or stainless steel BD EN 10088-2-1 4301.